The Conference Hall as seen in Mario & Luigi: Bowser's Inside Story. 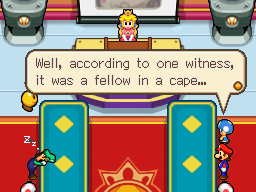 The Conference Hall is one of the many rooms in Peach's Castle, seen during the events of Mario & Luigi: Bowser's Inside Story. 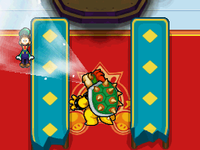 Judging from where Bowser falls during the events of the game, the room sits on the second floor of the castle. At the beginning of the game, a meeting is held here to discuss the Blorbs, a new disease that is plaguing the kingdom. Princess Peach, Toadsworth, Toadbert, Dr. Toadley's intern, and the Toads are present. Later, Starlow arrives, but cannot think of a way to stop the Blorbs. After arguing, the intern leaves. Soon, Mario and Luigi arrive at the meeting. Bowser inhaling Luigi in the Conference Hall. During the meeting, Bowser intrudes and asks to be part of it. After he is rejected, he gets angry and fights Mario, even though he is weakened by Starlow and Peach. Mario easily defeats Bowser, and Peach flings him out of the castle and into Dimble Woods, where he lands unconscious. After Bowser wakes up, he receives the Lucky Shroom and returns to the castle. Once back at the castle, he reveals the ability given to him via the mushroom and inhales everyone in the room, falling unconscious when he is finished: Fawful then walks in and orders Midbus to remove Bowser. Near the end of the game, Bowser returns to the Conference Hall for his battle with Dark Fawful, now with Fawful's emblem on the floor instead of Peach's and with the projector screen in the back repaired (perhaps implying that Fawful also wanted to use it as a Conference Hall). After his defeat, Fawful collapses into the Dark Fawful bug and flees. When Bowser appears at the start of the game he punches the table, however it is impossible to break the table with Bowser near the end of the game. During the scene where Peach, Mario, and the Toads discuss the issue of the Blorbs, Luigi falls asleep. This page was last edited on January 1, 2019, at 13:47.